Unless they’ve somehow managed to hide from me, which is highly unlikely, there really aren’t many indie games with co-op, local or online. As such, the inclusion of this got me interested in Super Space ____, even though it’s not online enabled. This is likely going to be a deal breaker for some, because, you know, local multiplayer is extremely boring – oh wait, no it isn’t! I’ve got two words for you Internet crazed people: couch gaming. Anyway, in Super Space ____, each player will be in control of a turret, tasked with blasting the crap out of, well, asteroids of course! What, think it sounds just a bit uninspired? Well, I haven’t told you the twist yet: all participants are attached to “a block-y, misshapen space ship”, and movement is restricted to recoil from shooting – bet it sounds interesting now, eh? One can only imagine the inevitable chaos caused by up to four people, all firing in different directions, sending the ship spinning and twirling through space in the process. Oh wait, that actually sounds like a ton of fun! Super Space ____ is a couch co-op arcade shooter about competition, cooperation, communication and the democracy of physics. While teamwork is vital for survival, there will be times when taking matters into your own hands is the better option, since the game keeps track of both the team score and that of each player. Who said ‘co-op’ means ‘always working together’, anyway? Just keep in mind that if one person dies, everyone dies. So don’t get too greedy, or you just might find yourself removed from the couch. 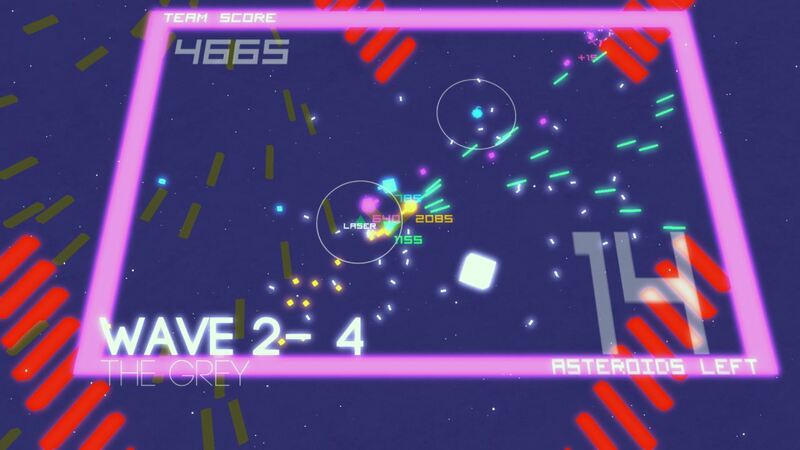 But if you have a couple of controllers and friends who can be persuaded to join you, then by all means, download Super Space ____ right now and go nuts! Remember, sometimes there is an ‘I’ in ‘team’.